Warning! 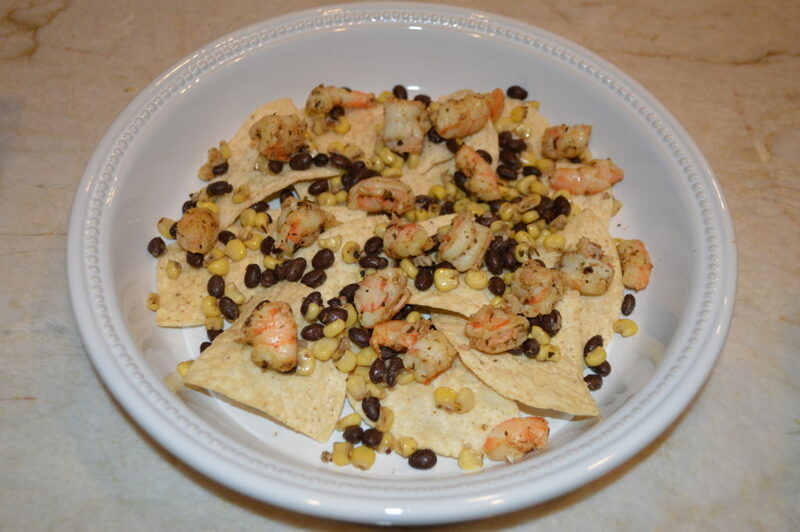 Highly addictive Shrimp Nacho recipe below. 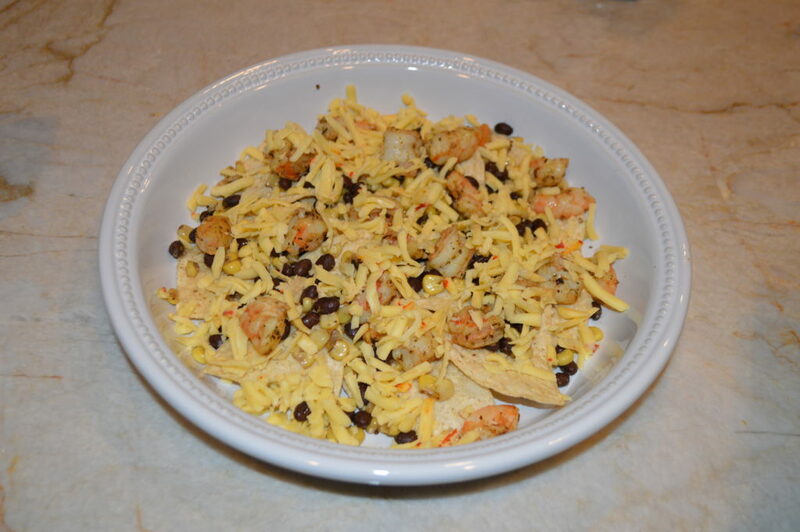 If you have any shrimp lovers coming over on game day this is nacho recipe is a must have. 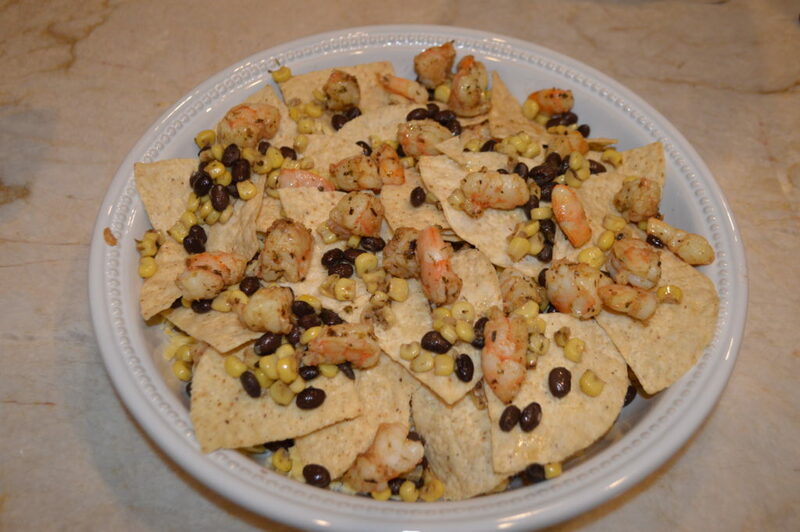 Best of all, you can make the salsa, bean and corn mixture and even the shrimp ahead of time and then just assemble and bake when the game comes on! Touchdown on the prep. I secretly love football junk food. It’s a fact. There is something so comforting about some chicken wings and nachos and a good old seven layer bean dip. Nostalgia? Maybe. So when it comes time for the Superbowl every year I find myself giddy with anticipation of the junk food I get to consume. 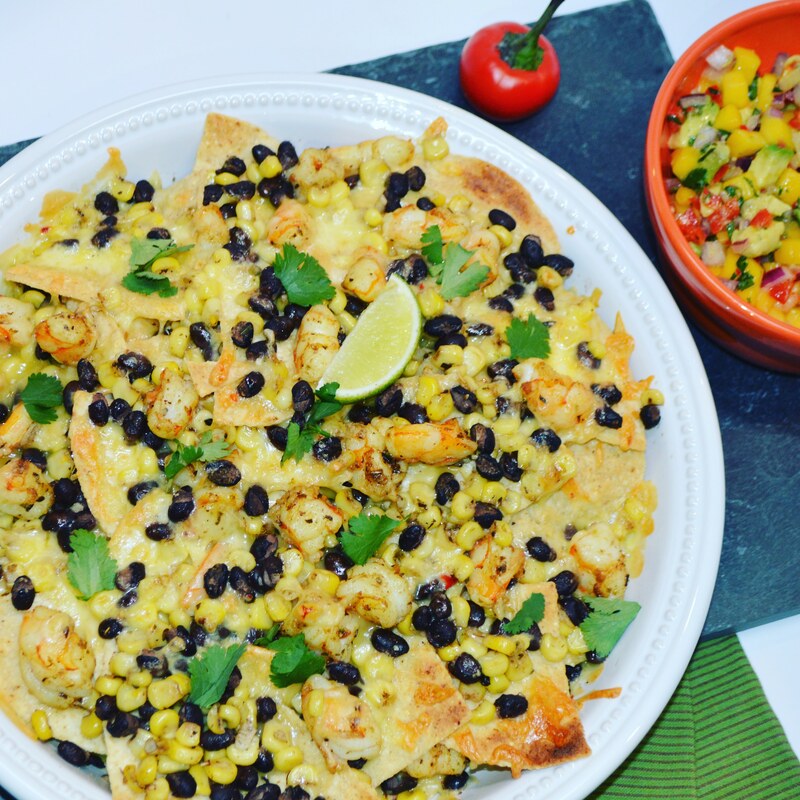 This Shrimp Nacho recipe hits all the right notes for me but is a tiny bit lighter because I use shrimp, corn and beans and a fresh mango and cherry pepper salsa instead of sour cream and meat. The game plan is easy. I started by making the bean and corn mixture. 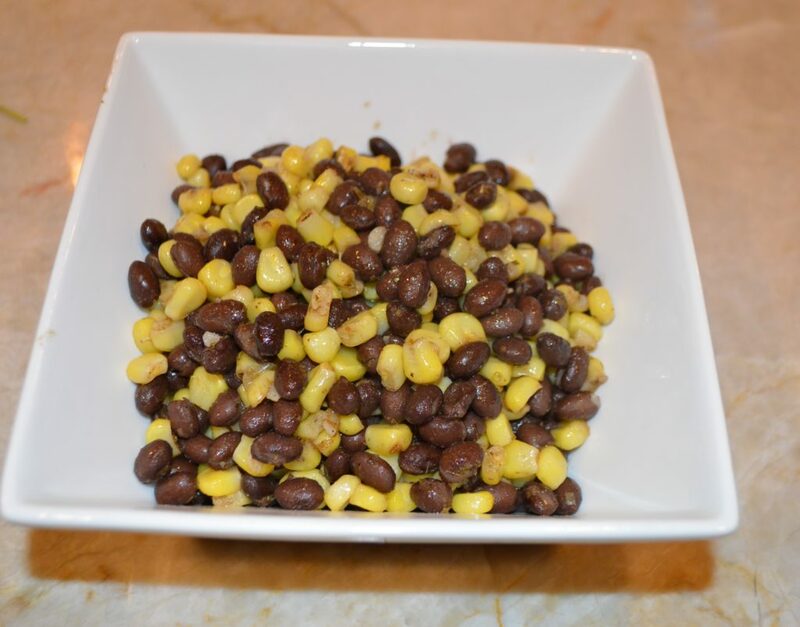 You can use frozen corn (defrosted) or fresh corn. Your pick. Just heat some garlic in a pan and toss in the corn, black beans, some oregano and cumin and salt and that’s it. 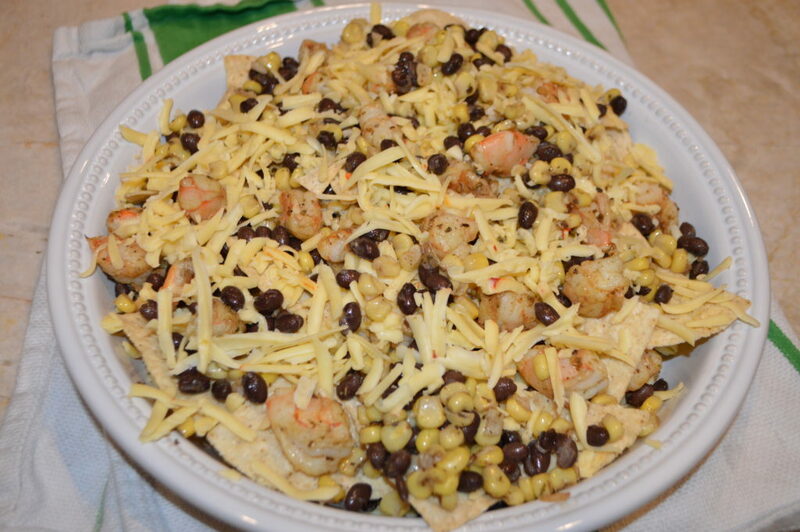 The idea is to get some flavor into each component that goes on the nachos and that way when you layer the ingredients on and take a bite you can taste all the flavors together. Next I made the salsa and just combined all the chopped ingredients in a bowl and put it in the fridge. That can be done a day ahead even. 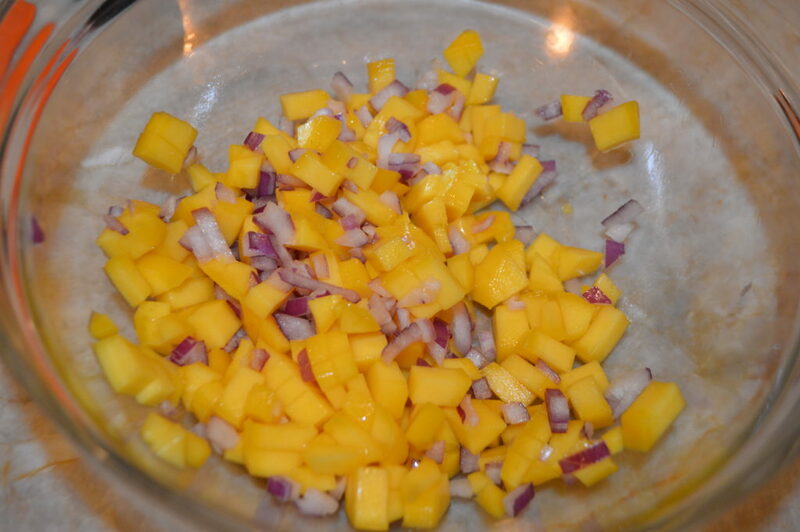 The key to the salsa is a perfectly juicy, ripe mango. Also, I found cherry peppers at my grocery store. They are little red peppers that aren’t as hot as a jalapeno or Serrano but have a bite and a building heat. I liked the color they added and they didn’t overpower the dish. Plus we use some spicy cheese later so you don’t need a lot of heat here. But, if you can’t find cherry peppers don’t fret. You can certainly use a jalapeno (red if you can find it). 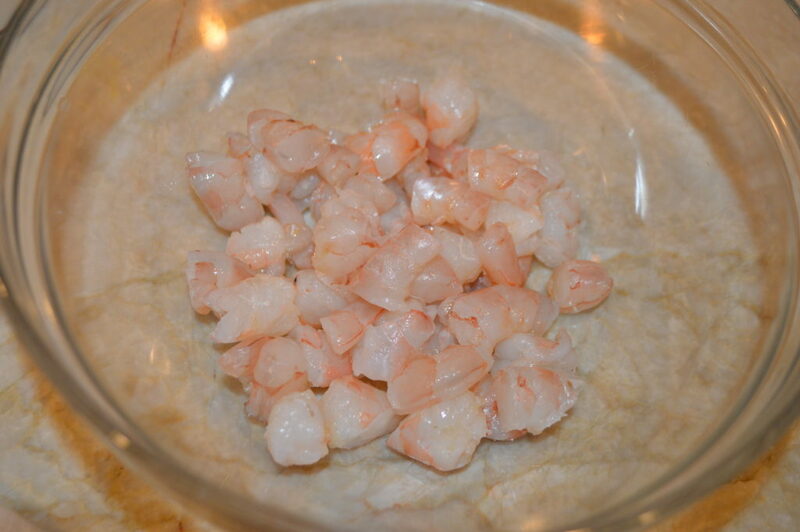 Lastly, I peeled and de-veined my shrimp and cut them into about 1/4 inch pieces. I added them to a bowl and coated them with canola oil, cumin, oregano and salt. 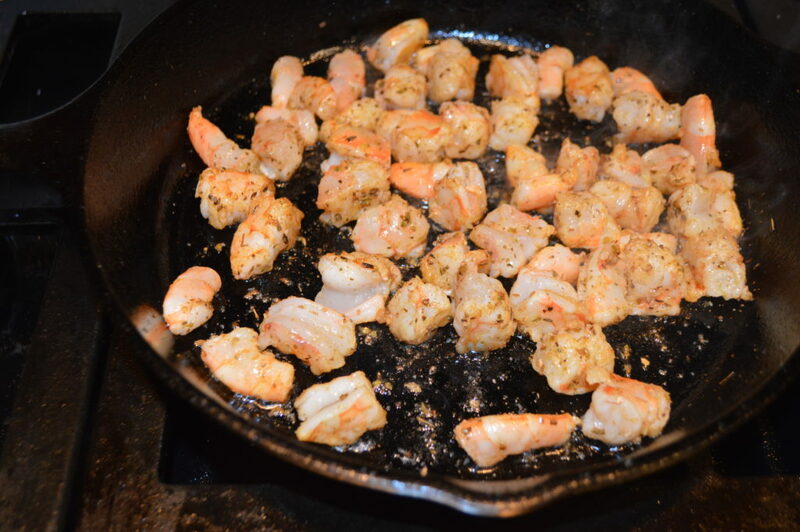 Then I heated up a skillet with a little more oil and quickly sauteed the shrimp. They are small so they go quickly and only take a minute or two max. Remember they will be reheated later so be careful not to overcook. And that’s it. Just find yourself an oven-proof platter and start layering your ingredients when you are ready to party. In my opinion you need to carefully space out the ingredient to chip ratio. Not too many chips. Remember they are there to scoop the good stuff into your mouth. 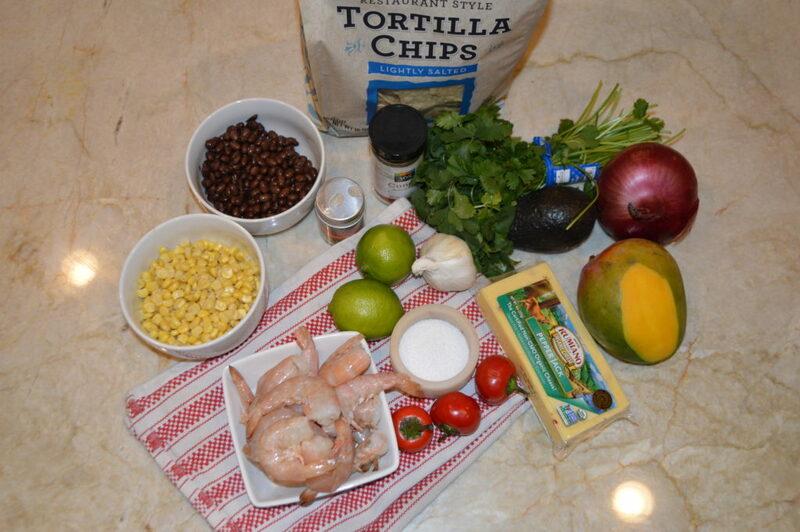 So a single layer, then some corn and bean mixture, some shrimp, a layer of cheese, and repeat. I like to add a little extra of the bean and corn on the top layer after the last cheese goes on. Then bake in a 350 degree oven until melted. Place under the broiler for a few seconds if you want to get that browned top look to the cheese. 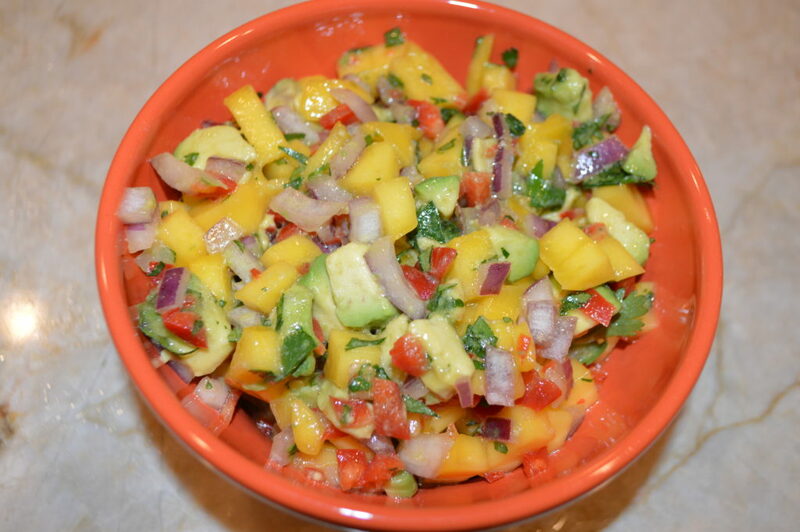 Serve with lime wedges, cilantro and the yummy mango and cherry pepper salsa! #Winner! Step 1 in the game plan is to heat the corn and beans together with some garlic, cumin, oregano and salt to get some flavors going on in what otherwise would be bland ingredients. 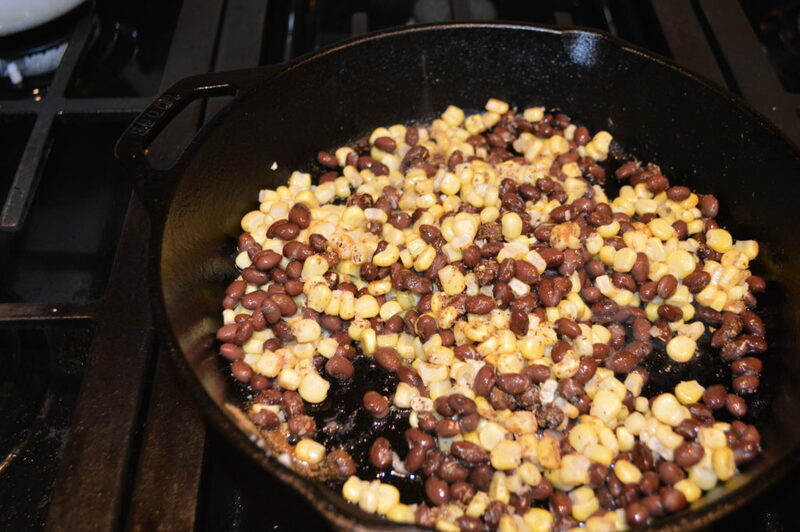 Heat a skillet, add about 1 Tablespoon of oil, then the garlic, corn, beans, and spices. 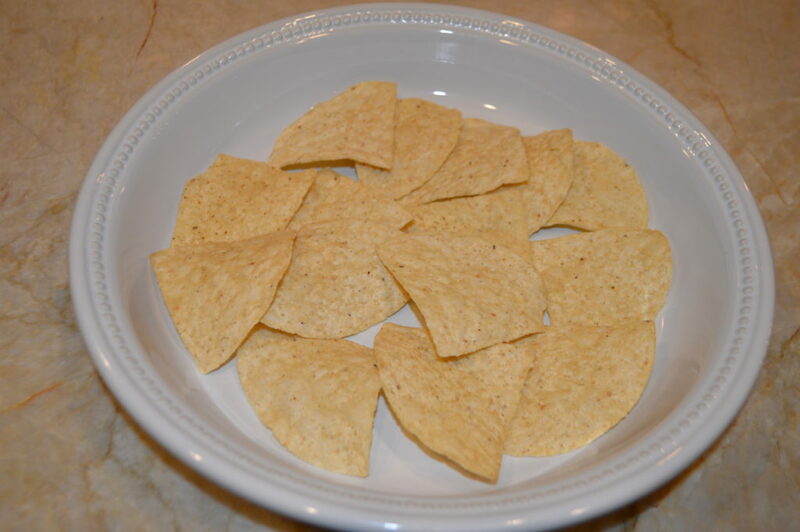 When heated through, about 3-5 minutes in the pan, set aside in a dish to add to the nachos later. Wipe the pan clean for the shrimp. Now lets make some salsa! 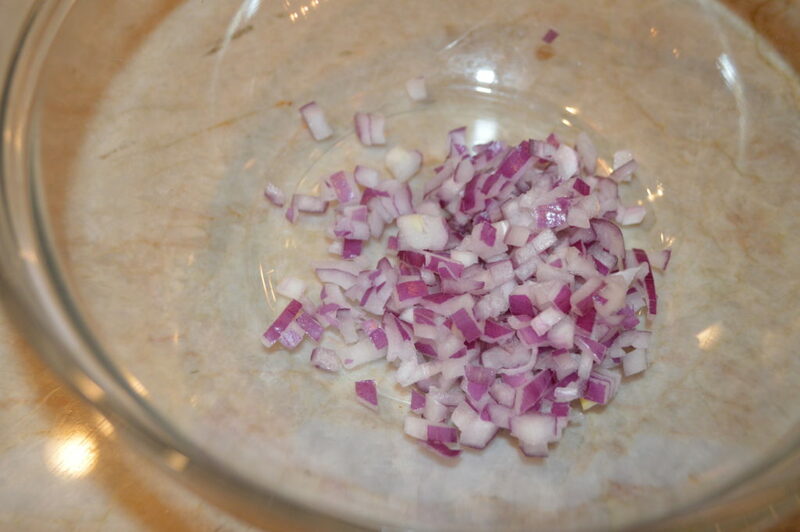 Start with diced red onion in a bowl. 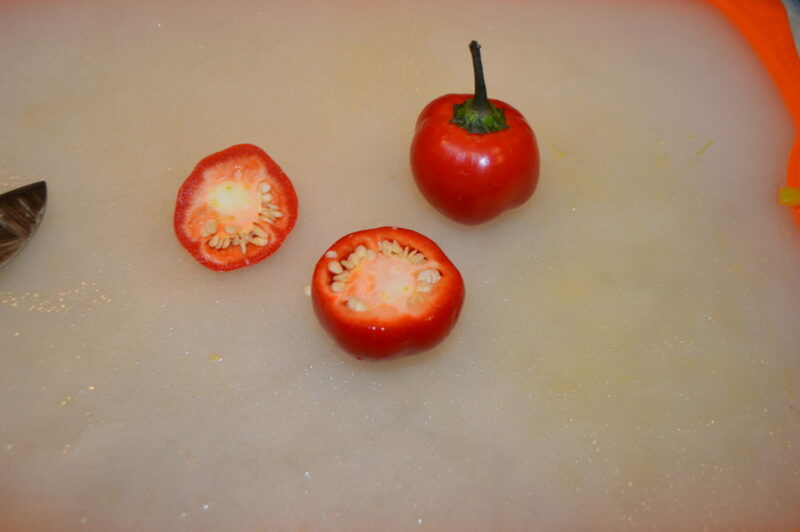 Next comes the cherry pepper. Remember if you can’t find cherry peppers don’t sweat it! 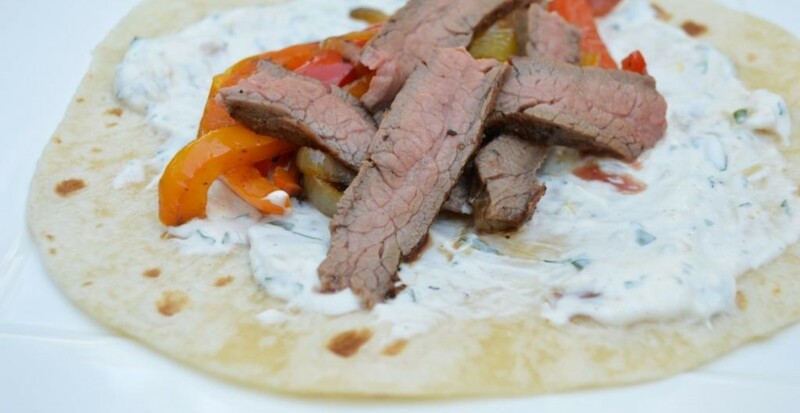 Just substitute with one jalapeno pepper instead. Then add in the fresh squeezed juice of one lime and the avocado. Finish with some fresh chopped cilantro and salt and mix gently to combine. Viola! 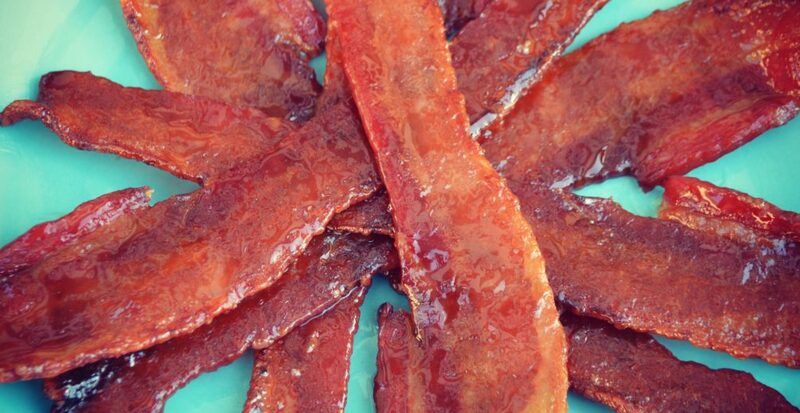 Set aside or cover and refrigerate up to overnight if making ahead. Now that we have that done let’s get the shrimp ready. It’s quick and easy. Make sure the shrimp are peeled and cleaned (de-veined). Then cut into pretty big sized chunks of equal size. About 1/4 inch or so. 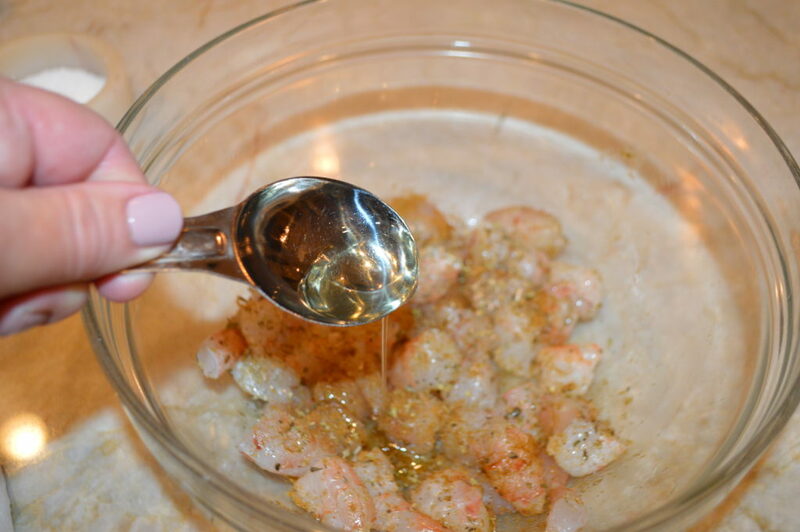 Then add the dried oregano, cumin, salt and about 2 Tablespoons oil to coat the shrimp. Heat a skillet over medium high heat and add about another Tablespoon or so of canola oil. 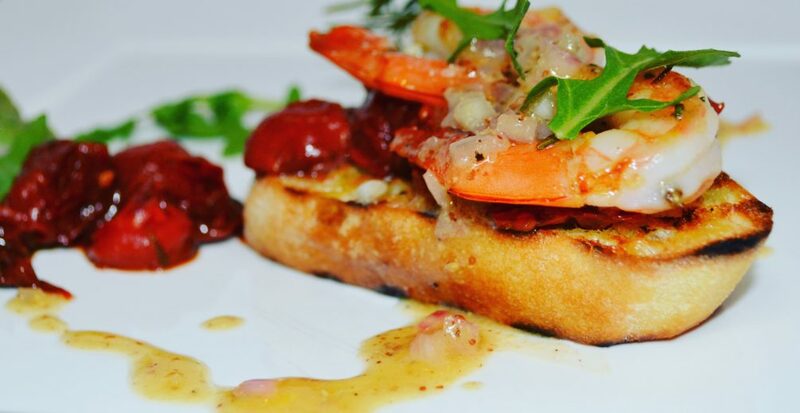 Saute shrimp for 2-3 minutes tops. Set aside or refrigerate if making ahead. Now it’s game time. Are you ready to assemble and eat? 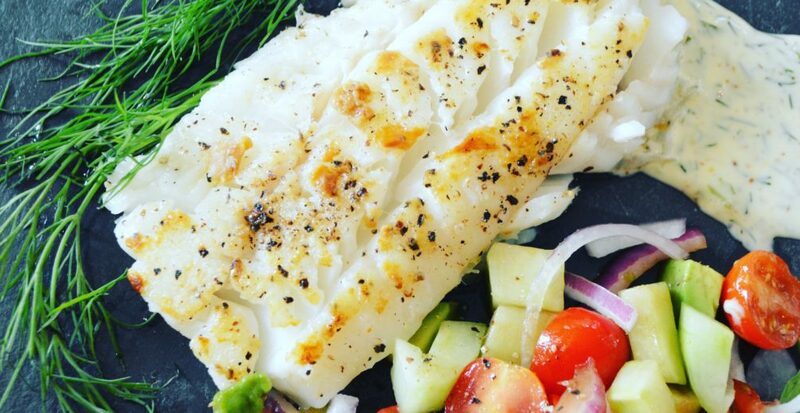 Preheat the oven to 350 and grab yourself an oven-proof dish. 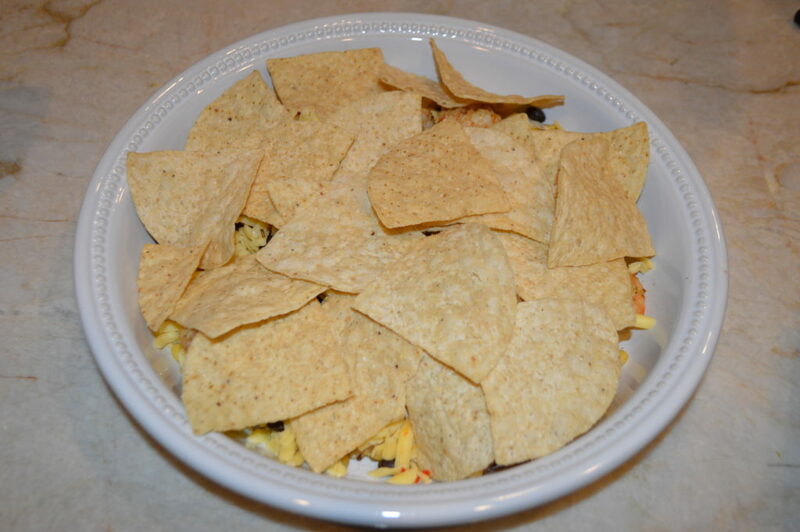 Start with a single layer of chips – just enough to cover the bottom. Then start piling on the good stuff. Leaving about half or maybe a little more than half for the second layer. Then of course some cheese…..and we are using a spicy pepper jack but you can use another type if you prefer. Just make sure it’s a melty kind of cheese! And the final layer of cheese…..
Ready for the oven! Bake until the cheese is melted and then place under the broiler for a final few seconds to get the top browned. Be careful to watch them! 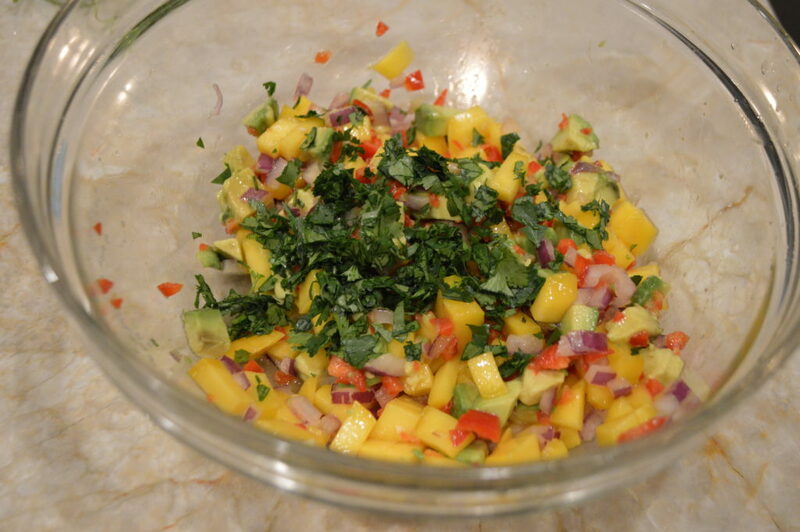 Serve hot with fresh cilantro, limes and the cherry pepper mango salsa. 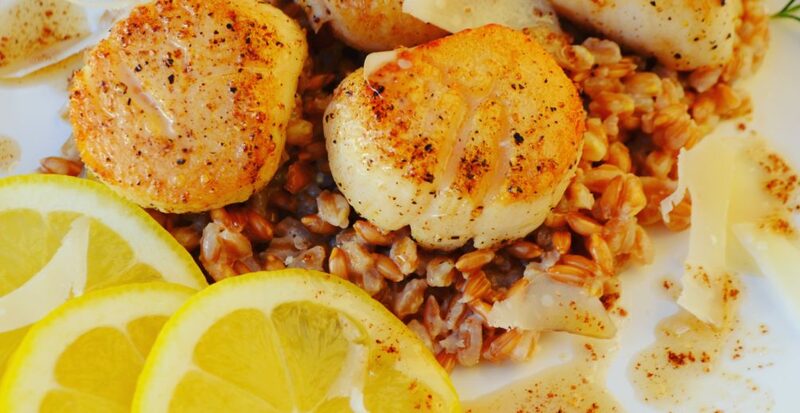 Heat a cast iron skillet or heavy pan over medium heat and drizzle in a little olive oil. When hot add in the garlic, corn, beans, oregano, cumin and salt and stir for 3-5 minutes until the flavors are combined. Remove to a bowl and set aside. Clean out the pan. 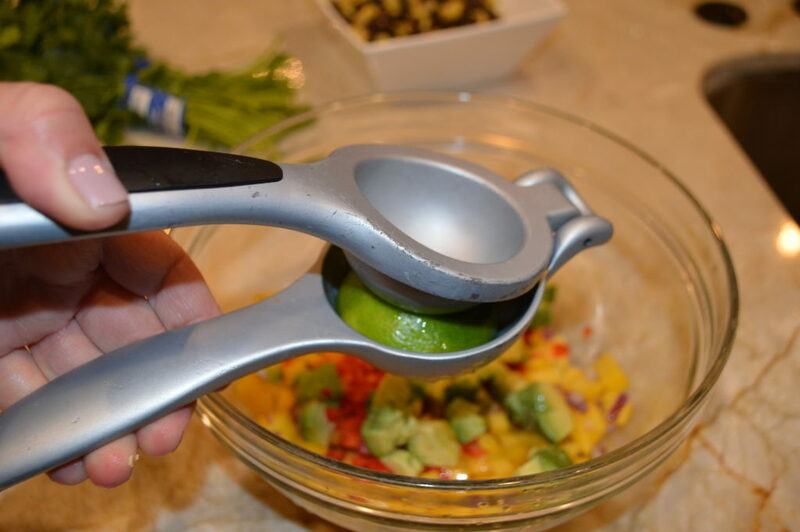 Make the salsa by combining the red onion, mango, cherry peppers or jalapeno peppers, lime juice, avocado, cilantro, salt and oil in a medium dish. Gently stir to combine and set aside. 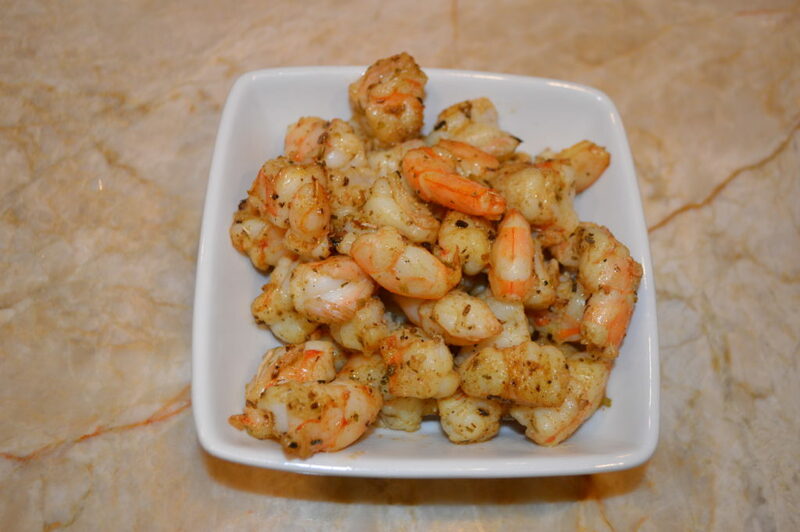 Combine the shrimp in a medium bowl with the oregano, cumin, salt and canola oil. Mix to combine. Heat the same skillet over medium high heat and add a little more canola oil to the pan. 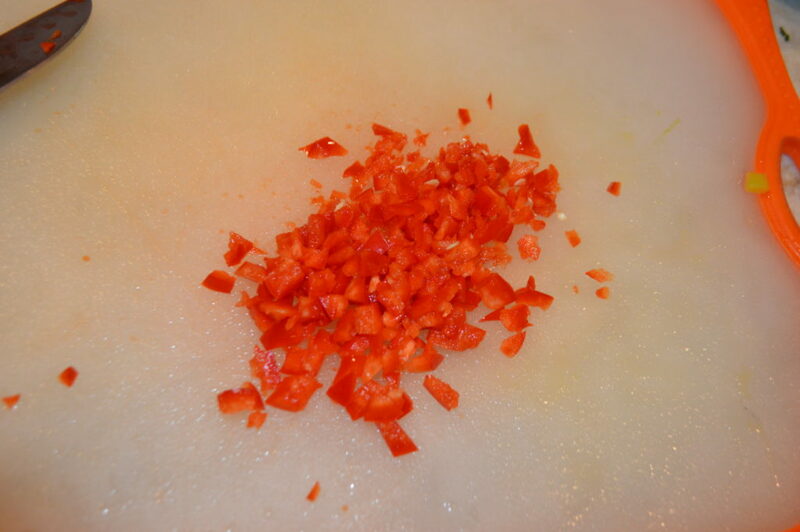 Then saute shrimp for 2-3 minutes until just barely cooked through. Don't overcook. Set shrimp aside. Preheat oven to 350. 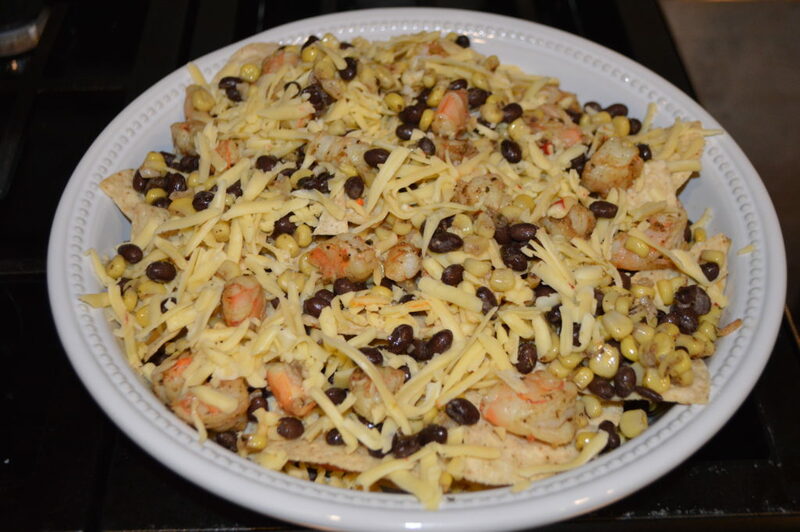 In an oven proof dish assemble the first layer of nachos with the chips, then the bean and corn mixture, then shrimp, and a first layer of cheese. Make sure to save at least half of all the ingredients for the second layer. Repeat the second layer and bake until the cheese is melted. Place under the broiler for the final few seconds (optional) if you want a browned crusty top.